[Review] King’s Quest I: Quest for the Crown – I ❤ Old Games! Well, here we are again. After a long time I’m back to game reviews as this blog was intended to be when it debuted three years ago. This time I’m going to cover an influential game of the 80s, King’s Quest that this year will turn 35. Some of the fellow bloggers I follow had already covered this game or other from the series, so fur further informations you can check, for example, Hungrygoriya Let’s Play on youtube dedicated to the fifth installment. Have a good read! Graphic adventures are some of the best games ever released in mjy opinion and you can get a confirmation of this statement if you check the Games Ranking page. The golden age of these adventures is the first half of the 90s but the roots of the genre have to be tracked in the early 80s. King’s Quest is the forefather of the genre, since 1980 fore-forefather Mystery House cannot be really considered “graphic” and is still a hybrid with a lot of influences from earlier interactive fictions. As frequently happens in my gaming experiences I’ve first played the later games (King’s Quest V and VI) and discovered later the earlier. Although, of course, to a modern eye the games looks more like a quirk, its intrinsic value is undoubted and, along with its sequels, remains one of my favourite adventure series on PC. 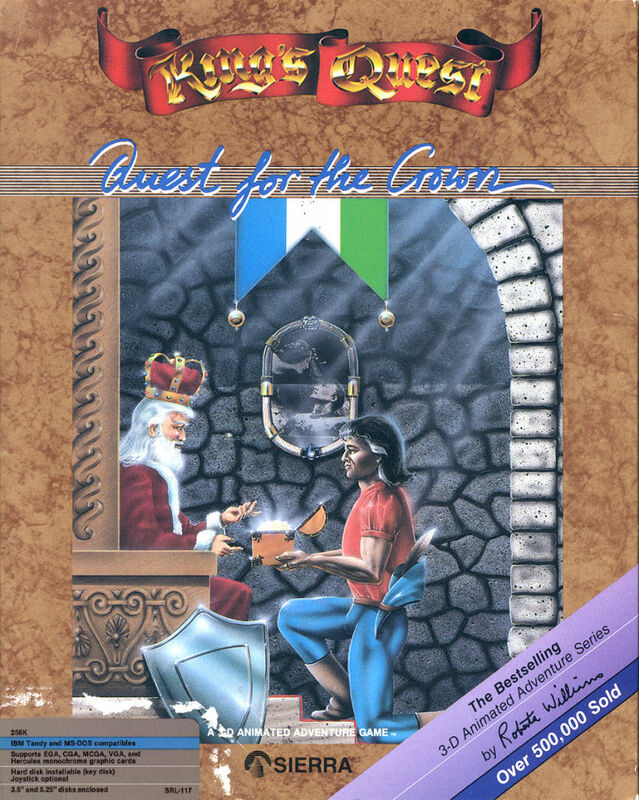 Even though now it looks like a joke, King’s Quest was a leap forward in video games. It took Sierra 700000$ and 18 months to develop it and graphically it’s clearly visible. Although it made use of a palette of only 16 colors with an intelliget use of dithering the colors look way more. The game introduced also a rudimental 3D effect, since the characters are free to walk in front or behind the objects that have their own phisycal dimension. 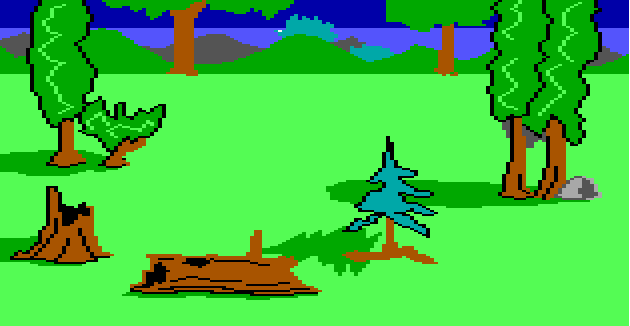 The drawings look a bit childish and seem like they come out from Paint but they were something innovative and a breath of fresh air in the old interactive fiction genre. Plus every action had its own animation so the characters on the screen were “alive” and not mere figures on a plain background. Let’s be frank, at Sierra they didn’t spend so much time elaborating a plot for King’s Quest. The story is the most orifnary you can even read, since involves a near-to-death king willing to give the throne to an hero in exchange of the success in a angerous adventure where he has to find some magic items to restore the old strenght of the kingdom. 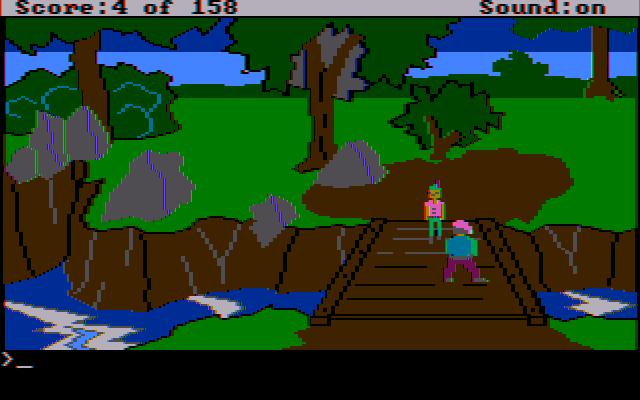 King’s Quest is the first game to use the graphic engine AGI. Originally at Sierra they were using the GAL (Game Assembly Language) but when its creator, Arthur Abraham resignes, Sierra found itself without an engine and only a “gift” from IBM that had recently developed the new Adventure Game Interpreter, saved the company. the AGI became the standard engine in Sierra adventures and was used until 1930 when it was substituted by the SCI. The game gives you different option when you reach a key moment of the game, for example when you have to deal with the troll guarding the bridge: you can either give him the golden walnut, the sack of diamonds or even the golden egg, although in this case you won’t be able to beat the game. Every time an action is performed correctly your score increased till ther maximum of 158 if you play by the rules. For example the first time I’ve played it I’ve slayed and killed the goat (poor goat…) and even though technically I could still complete the game, my score suffered a lot. The puzzles in the game are not particularly difficult and usually they can be solved within a few moves and the thing that makes them sometimes hard to solve is the parser that (as in every interactive fiction) accept only a precise input. 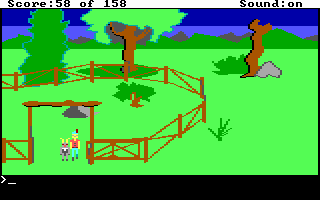 Being one of the first graphic adventure, King’s Quest still bears some features of the interactive fiction. You can freely navigate the scenario using the arrow keys and perform some easy actions link jumping, ducking or check the inventory by ppressing a key, but everytime you need to perform more complex actions you need to type what yoy want to do. And sometimes this could be a bit a pain in the back. Since you have a graphic environment you shoudl be able to examine the setting by yourself but mosrt of times the clues are not 100% visible and you need to examine in depth every single flower, bush or tree you find. For an english speaker player the task is surely easier but for a foreigner like I am this is more complicated: for example you’ll be landing in a place where you find two logs on the ground. I immediately noticed that one was different then the other but when I examined them typing “examine log” I failed since the parser didn’t recognize the same word for both but one was a “stump”, and that is a word I learned during the game (I have to check it online otherwise I would be stucke there for eternity). The parser is far from being the magnificient creature it was in games like Zork but is a rather basic parser in which you have to write the right word in the right order without being too verbose. 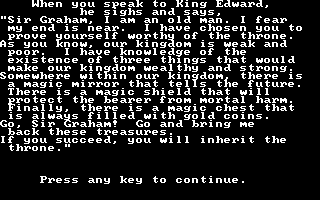 And while Zork for this reason is more desirable and easy to pick up and play for a non-english speaker, in King’s Quest this is a bit of a problem. There are three speeds in the game but they’ve been calibrated very badly: the normal speed is too slow (I didn’t even check the “slow” speed to avoid falling asleep) and with the fast speed you’re barely able to control Graham. Probably a bit of fine tuning would have been better but all considered, and considered i was 1984 KQ was a huge step forward in the adventure genre. There’s nothing important to tell about the sound. The game is 90% of times silent and all you can here is an introductory tune when a fairy or an ogre cross your path. King’s Quest features 48 different screen (plus underground and “sky”) and with its meagre plot is rather easy to complete and has almost no replayability value, unless you’re a fanatic of the genre. Luckily enough the world is wrapped around itself so if you walk till the far left you’ll end up at the far right of the scenario. Of course this is caused by the additional disk space required for graphics and sound so it’s normal that is way shorter then a traditional interactive fiction. If you don’t speak a perfect english the task is a bit more challenging but the game will take you no more then a week to complete. Pingback: [Editorial] Guess what’s next on I ❤ Old Games! – 10/02/19 – I ❤ Old Games! Pingback: [Editorial] Guess what’s next on I ❤ Old Games! – 03/03/19 – I ❤ Old Games! Pingback: [Editorial] Guess what’s next on I ❤ Old Games! – 10/03/19 – I ❤ Old Games! Pingback: [Editorial] Guess what’s next on I ❤ Old Games! – 17/03/19 – I ❤ Old Games! Pingback: [Editorial] Guess what’s next on I ❤ Old Games! – 24/03/19 – I ❤ Old Games! Pingback: [Editorial] Guess what’s next on I ❤ Old Games! – 31/03/19 – I ❤ Old Games! Pingback: [Editorial] Guess what’s next on I ❤ Old Games! – 07/04/19 – I ❤ Old Games! Pingback: [Editorial] Guess what’s next on I ❤ Old Games! – 14/04/19 – I ❤ Old Games! Pingback: [Editorial] Guess what’s next on I ❤ Old Games! – 21/04/19 – I ❤ Old Games!